The Craig Widdison Yard will saddle up a number of runners to the Corowa Race Meeting on Tuesday July 4, with Art She Quick, Lord Laurie, Baby Zara, Cochran's Gap, Murdoch's Joy, Cagney, As Bad As Tyson and Steve's Choice all competing under overcast conditions racing on a good (3). Art She Quick will compete in a maiden plate over 1300 m with Nick Souquet aboard jumping from barrier 11. Last time out the three-year-old Bay Filly finished third of 11, on June 17 with Nick Souquet, piloting the runner to a 7.25 length placing to Misty Girl in a time of 1:12.40. Race three will see two Wodonga visitors in Lord Laurie and Baby Zara, compete in a BM55 Handicap over 1300 m with Nick Souquet aboard Lord Laurie & Chelsea McFarlane aboard Baby Zara. Lord Laurie is three-year-old Bay gelding having won on one occasion & placed seven times from 14 starts with a last start effort at Wangaratta finishing 6 of 14 on June 22 with Nisc Souqut arriving 1.30 lengths behind Darcy's Law. 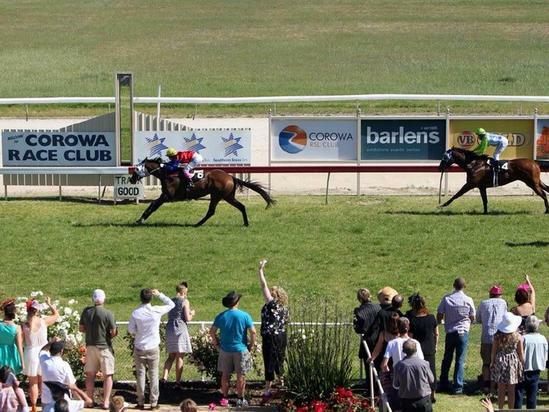 She was last seen at Corowa on June 13 finishing 10 of 12 with Ms Kayla Nisbet landing 5.03 lengths behind Tumult over 1200m. Cochrane's Gap will run third up from a spell in the Corowa Race Club class one combined maiden plate over a mile with Lester Grace aboard jumping from 12. Last time out the five-year-old chestnut gelding finished 11 of 14 at Swan Hill on June 11, arriving 9.20 lengths behind, Damn Wicked Left with Ms Linda Meech aboard arriving in a time of 1:38.36. Race six on the card will Murdochs Joy, combine with Brody Loy, in the Bill Purcell SDRA Winter Series handicap over a mile with the runner to be leaving barrier five. Murdoch's Joy was last seen At Swan Hill on June 11 arriving 11 of 13 with Ms Linda Meech the pilot landing 9.05 lengths behind Victory Downs in a time of 1:36.04. Race seven on the card will see two Widdison runners eye the prize in the Ray Sykes Memorial BM65 handicap over a thousand metres with As Bad As Tyson returning from a spell with Nick Souquet to ride jumping from barrier three and Cagney to be ridden by Ms Chelsea McFarlane leaving barrier (2). As Bad As Tyson has won on three occasions and placed three times earning prize money exceeding $48,000, having last raced at Seymour on February 6 arriving six of seven behind Hydro Force with Daniel Moor aboard. Cagney has won twice & placed twice from 8 outings earning prize money exceeding $31,000. He was last seen in a field of 10, at Bendigo on June 21, with Luke Nolan piloting the runner to a 2.95 lengths 6th to Levitical. The final stable runner will enter in race eight in the Paul Francis class 2 handicap over the thousand metre sprint with Steve's Choice to be partnered by Brady Loy jumping from barrier nine. Steve's Choice is a five-year-old chestnut mare having won on two occasions & placed six from 16 starts with a last start recorded at Benalla on January 15 finishing third of 12 with Chris Caserta arriving 1.15 lengths behind Kissee Mee in a time 1:03.89 for the 1106m run. The stable wishes connection the best of luck at Corowa on Tuesday.